Honda PCX 125cc touring scooter was made in Vietnam in 2011. PCX means Personal Commuter Next Generation that’s Honda new small friendly 125cc scooter. Despite its popularity in many countries, surprisingly Vietnamese people don’t really like it. Even in our rental business, the inquiry was quite low so we discontinued providing this model in 2012. In general, PCX is a stylish and decidedly sporty new mid-sized Honda scooter that really delivers on routine errands, short commutes and even enjoyable little getaways – the 2011 PCX™. Its modern good looks combine with easy handling to create a practical yet fun riding companion. Thanks to its strong-running 125cc liquid-cooled, fuel-injected four-stroke engine, and capable chassis, the PCX serves well for getting around town and even for back-road weekend adventures. With comfortable seating to accommodate the rider plus a passenger and a surprisingly large under-seat storage area that’s big enough to swallow a full-face helmet and more, the PCX serves as an accommodating package that rolls economical transportation and a fun-filled ride all into one. – Modern looks evoke styling cues from sport motorcycles. – Comfortable seat offers accommodations for two-up riding. – 1.6-gallon fuel tank offers ample cruising range. – Instrumentation includes speedometer, fuel gauge, and trip meter. – Ignition system/steering lock helps provide security when parked. – Side stand and centre stand offer parking options. – Large, lockable under-seat storage space can hold a full-face helmet and more. – Helmet hook under the seat. – Storage compartment under the dash for small items. – Fuel tank located under floorboard for the lower centre of gravity and enhanced riding traits. According to Japanese engineers, this scooter would reduce consumption by 5% (and therefore all the CO2 emissions). Okay, if you are looking for 125cc scooters to commute in Hanoi this is a pretty good choice for now. Honda PCX 125 is the best 125cc scooter for 2011. How much for 10 days? Sadly, we discontinued renting this bike due to very low demand. 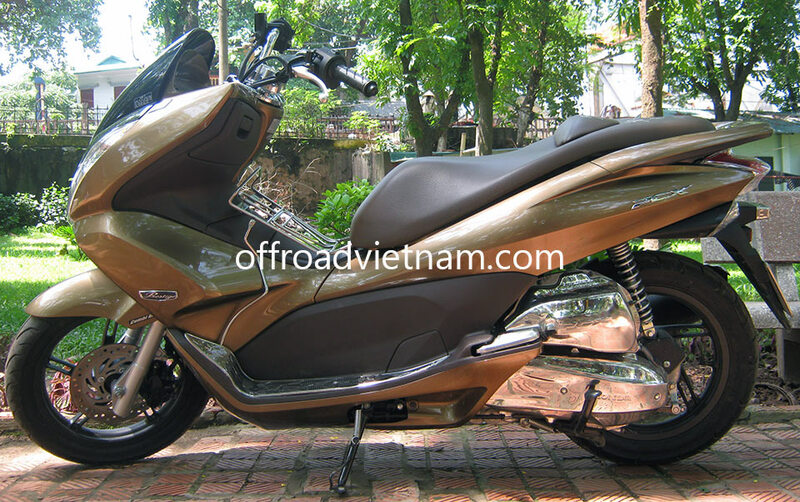 You can consider Honda Vision 110cc, it’s light, fast, powerful and is Honda Vietnam’s best seller. 12$US/day.